Let’s begin with the highlight of this film, Africa! It is one of the most beautiful locations to visit for either a romantic getaway or a fun-filled family vacation. Now that we got that out of the way, let’s talk about this generic romantic comedy that sadly does no favors for Happy Madison productions. We’ve grown accustomed to Adam Sandler’s raunchy and outlandish sense of humor, which for a good period of time produced authentic comedies. Recently, Sandler’s projects have been quite the disappointment. Obviously it’s hard to top Billy Madison or Happy Gilmore, but among his past flubs there are some truly wonderful classics. The Wedding Singer is easily one of his greater films. It’s the first time we got see an enchanting blend of Adam Sandler and Drew Barrymore. The chemistry was there, and I don’t blame Sandler for wanting to continue making movies with the adorable comedic actress. Seven years after their first collaboration, they reunited for the off-beat comedy, 50 First Dates. Given this was such a unique story and their chemistry was slightly apparent, I would categorize 50 First Dates in the “wonderful classics” pile. Not my favorite, but definitely a memorable romantic comedy. Now, after nine years since their second film, the two have joined forces once again for their new family rom-com, Blended. After Jim (Adam Sandler) and Lauren (Drew Barrymore) endure a horrible blind date they hope to never cross paths again. Jim a widowed father with 3 girls is still grieving his deceased wife. Lauren a divorced mother with 2 boys just wants to bring romance back into her life. While dealing with their own personal issues, they make sure to put their kids’ happiness first. So when they get the chance to vacation in a luxurious African resort, the single parents jump at the opportunity hoping their kids will be thrilled. Unfortunately they have been suckered into a family “blending” vacation, purposely meant to bring families closer together. Oh no! But they hate each other… I think you can already see where this is going. Blended is not as bad as the trailers make it look, especially if you compare it to movies like Jack and Jill or That’s My Boy. It’s a cute film. The problem is there isn’t anything special about this story to make it stand out. In fact, his flubs may stand out more just because they were that bad. This is a forced love story with the most cliché subplots, and the expected slap-stick moments. The climax had to be the weakest turning point I’ve seen in any romantic comedy. I did enjoy seeing Adam Sandler play a loving father for once. And though he and Barrymore still play off each other well, they seemed to have lost their romantic spark in this film. All the kids did a nice job. Bella Thorne (Shake It Up) had some laugh out loud moments as the tomboy daughter desperate to show her feminine side. 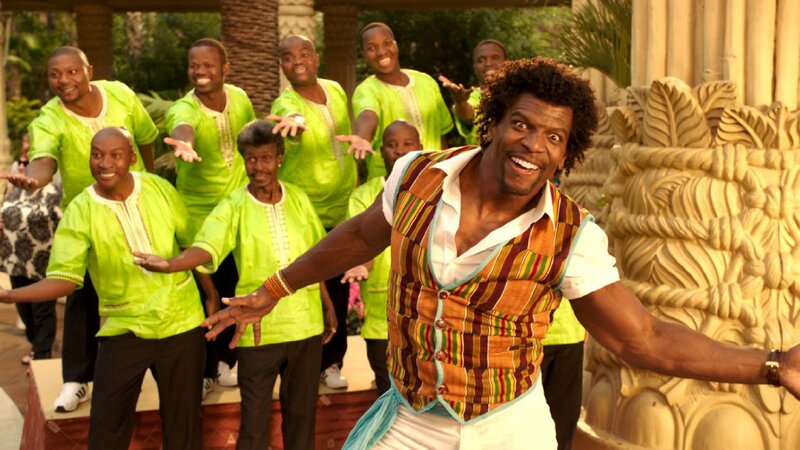 Terry Crews (White Chicks) makes for some chuckles as the ultra-exuberant, wide-eyed, muscled lead singer of the resort’s Thathoo Harmony Group. Also, keep an eye out for some familiar faces you’ll recognize from the stars’ past two films. Blended is a sweet and at times heartfelt film that is exceptionally fun while watching, but when it’s over you’ll remember the scenery and not necessarily the scenes. Own “Blended” on Blu-ray Combo Pack, DVD, and Digital HD on August 26th.